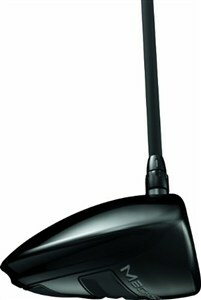 The round black driver head looks like a hockey puck on the end of a stick. It's designed for more workability over the square face. The "STR8-Fit technology" allows you to tweak the puck open or closed to your liking. And the light aerodynamics produces fast clubhead speeds with less spin on the ball, which results in bigger longer drives. The other advantage of this club is the sound. If you are ever lost in the forest and you've got your trusty driver with you (I never go hiking without mine), simply start hitting golf balls (or rocks, or pine cones) and somebody will find you quickly. The sound of the golf ball at impact can be heard for miles and miles. It is as pleasing a sound as a cow bell or car wreck. I recommend you check out the Nike VR Pro. It has a hotter face, a better look, and you can adjust it to 32 different positions as opposed to 8. If you don't want to shell out for the new one, check out last year's model.